Bulgarian Prime Minister Boiko Borissov has given a gloomy prognosis, saying that the world is “heading crazily towards conflict” and calling for diplomatic solutions. “Not far from us, Turkey is waging war with the Kurds in Syria, the Russians are there, the Americans, the Islamic State. People are dying, and at the same time, relations between the leaders are getting worse,” Borissov said. He said that there were two options, one being diplomacy and peace, the other being to “bring a Nato army to stand against another”. 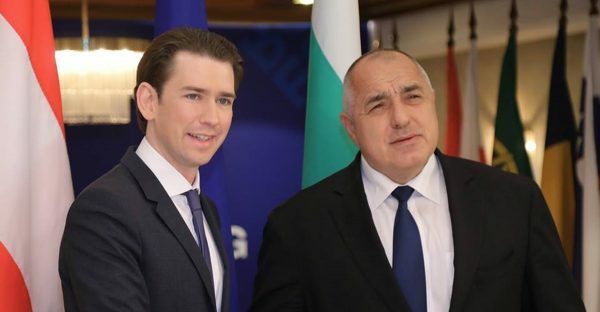 Borissov was speaking on March 15 after talks with Austrian Chancellor Sebastian Kurz, who was in Sofia after an earlier scheduled visit was postponed because Kurz was ill. In the second half of 2018, Austria will succeed Bulgaria as holder of the rotating Presidency of the Council of the EU. Borissov thanked Kurz for praising Bulgaria’s protection of the EU’s external border. The Austrian Chancellor also expressed support for Bulgaria being admitted to the EU’s Schengen visa zone. Earlier Kurz said that “the most serious area in which we have to work is security. There is a need for greater joint work on external borders, especially to stop illegal migration”. He thanked Bulgaria for its efforts in recent years “for having so strongly insisted on stopping the migration wave”. “At all my meetings I have emphasized that 2018 should be regarded as the Bulgarian-Austrian Presidency because none of the topics we are going to start can be completed in six months,” Borissov said. Borissov and Kurz expressed their shared view that the agreement with Turkey should continue to work. “We have the same understanding of border protection – to doe it so that people in Europe feel safe, to do it with the welfare of asylum seekers and, at the same time, to European diplomacy. We set a single goal for the leadership meeting in Varna on March 26 – to continue the agreement with Turkey to protect Europe,” he said. The two heads of government said that they would continue to work together for the European perspective of the Western Balkan countries as an opportunity for stability and prosperity in the region but also across Europe. Borissov said that regarding European transport corridors 4, 6, 8 and 10 he had Kurz’s “total understanding”. The Bulgarian Prime Minister said that by mid-May, when the leaders of the Western Balkans countries are due to meet in Bulgaria, “the hybrid financing should be prepared so that this project becomes irreversible during the Bulgarian and the Austrian Presidencies of the EU Council”.